Uh oh. I was really looking forward to making good use of that court once it warms up. Maybe there should be signage that says dogs not allowed. Is that something for the community board? 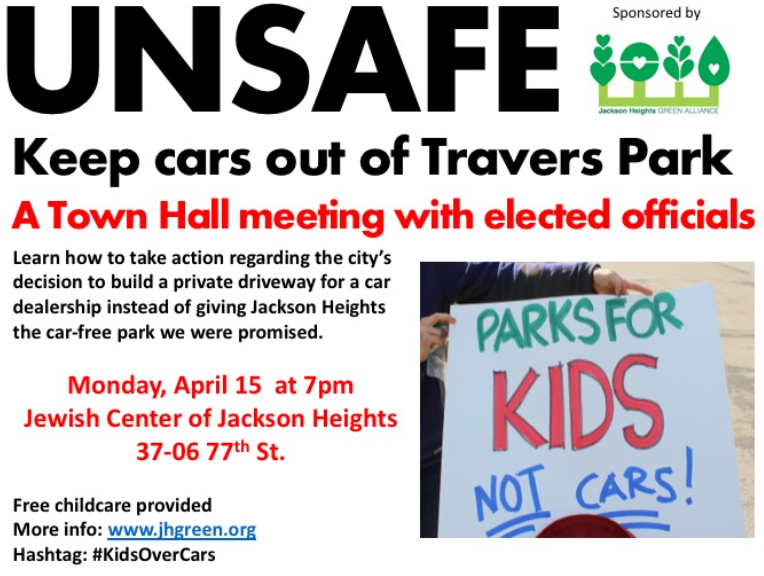 The city is abandoning a years-in-the making plan to transform a Jackson Heights street fronting a school and a park into a car-free plaza because a politically connected car-dealership recently opened a service entrance on the block — and activists are howling. The city was planning to ban cars on the entirety of 78th Street between 34th Avenue and Northern Boulevard to create a seamless play area linking the Garden School, Travers Parks, and Staunton Field — but now it’s tweaking the design to accommodate Koeppel Mazda, which wants to use a portion of the street to move cars around. The dealership is owned by Howard Koeppel, who has long been cozy with politicians such as Mayor Giuliani and Queens power broker Joe Crowley, the former congressman. Well, folks and politicians managed to stop Amazon. AOC has her office now in Jackson Heights. Let's see if she and the rest of our community can stop real corruption in own backyard. No prison, it’s been proven, no collusion. What’s next? Southern district. the whole family, aside from Tiffany, who's the one feeding all the inside info to prosecutors. Let's keep this on topic (Travers Park). sorry, was thrown off by someone -- i forget who -- rambling about AOC and corruption. Interesting logic. Blaming others for your choices. This post is also off topic. Please stick to topic or thread will be locked. Anyone know what happened today at Travers park with police and ambulance coming? I saw few kids playing on a tennis court when two men with two aggressive dogs came, one dog was biting pants of one of the men. When police came one man (on 77th street) was taken by ambulance and they didn't even talk to the guy with the dogs. He was then laughing when they just went through the park not caring about anything! If anyone knows what happened, please share. I thought it was great to finally see kids playing on the court instead of dogs, but it didn't last long. I complained to 311 but I guess no one cares. This is so tiresome compared to the real problems we have. on a purely economic level, i'd suggest those on the side of the dealership fund the driveway out of their own pockets, leaving taxpayers out of it.